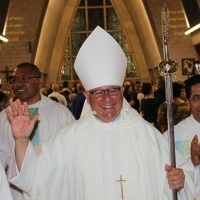 In June, Pope Francis announced that Fr Charles Gauci, then-administrator of St Francis Xavier Cathedral in Adelaide, would succeed Bishop Eugene Hurley, who had served in Darwin for the past 11 years.Pope Francis’ ambassador to Australia, Archbishop Adolfo Tito Yllana, read the apostolic mandate from the Holy Father, announcing Bishop Gauci’s appointment. Bishop Hurley served as principal consecrator at an overflowing St Mary’s Star of the Sea Cathedral. This entry was posted in Uncategorized on September 27, 2018 by ACBC Communications.